New Mango Habanero chicken wings were also added to the menu. Customers at Domino’s UK outlets can now avail of a spicier stuffed crust option. 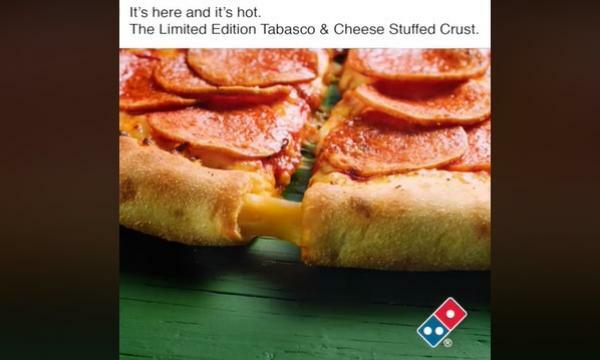 The pizza chain has introduced a limited-edition Tabasco & Cheese stuffed crust in a bid to reach consumers who prefer spicier options. “As customers become more sophisticated in their taste, travelling more and exploring new flavours, they’re getting spicier. They want to experience different heat levels and are clued up on the specific flavours they’re eating. They crave flavour that packs a punch,” Domino’s head of innovation Ian Straughan said. The pizza chain also added Mango Habanero-flavoured chicken wings as the sixth dish on its chicken menu. The new item now accompanies the chain’s chicken wings, chicken strippers, FRANK’S RedHot Wings, spicy BBQ wings and chicken kickers.